Improving completion rates requires consistent learner engagement. That means that CE coordinators must develop a course management process—or find a CME management platform—that makes it simple to assess current levels of student engagement and implement curricular changes when necessary. This post will present CE coordinators with three course management ideas that improve CME activity completion. 1. Consistently identify sources of friction in the activities completion process and eliminate them at the root. Medical professionals enter CME programs with an active desire to learn and translate that knowledge into better patient outcomes. When activity completion rates plummet, it is most likely a systemic failure, rather than a lack of motivation on the learners’ part. That means there is a roadblock hindering your students from continuing their learning experience—one they eventually believe is insurmountable. In order to fix this, you’ll need to identify potential pain points for users in the activities completion process. When do learners tend to abandon activities? Students who drop out very early on may find the activities format off-putting. Those who go much further and then simply give up when close to finishing the course may feel that the learning experience wasn’t addressing their specific knowledge gaps. Are users frequently submitting support tickets? This may indicate a structural problem with your LMS. Whether it’s a cluttered front end or activities that require too many steps to correct an input error, an LMS that generates a high number of support calls will continue to impact course completion rates until it is fixed. Is the LMS design tailored to the specific needs of current users? Finding out this information requires a bit of digging. Use learner surveys and support ticket data to discover if your LMS is a mismatch for the type of content your program offers. For example, webinars should be accessible from your LMS if they are a core part of your programming. If learners have to remember to visit another site to participate in a live course event many may miss their session. 2. Discard activities which do not consistently enhance learner outcomes and implement changes immediately. Learner knowledge retention and course satisfaction rates should increase over time, not remain static. Not only is constant improvement essential to growing your CME program, but it’s critical to maintaining ACCME compliance. Accomplishing this means you should redirect resources away from components of your CME program that are not supporting your end goal: keeping students fully engaged with their learning experience from the start to the completion of their activities. Diversify activity content to keep learners interactive. Use multiple choice, essays, rich media, or other elements as appropriate to keep users from feeling as if they are in a rut of the “same old same old” learning experience when using your LMS. Do not make learners work alone. An enterprise-grade LMS platform will allow you to provide automatic feedback to learners specific to questions answered or globally. This not only encourages course completion—as students are receiving real-time guidance—it increases the likelihood that they will feel confident enough to tackle a new course. Keep learners on track. Use scheduled inactivity notifications to gently remind learners to continue their work. Keep learners updated on course expiration dates with automated email reminders. For many CE coordinators, however, changing the design or content of activities is a lengthy and resource-intensive process. One the best ways to facilitate learner course completion is the use of an agile all-in-one CME platform which includes an LMS that can be easily updated when changes are necessary. As a CE coordinator, your most important job is helping your association achieve its CME vision— making certain that curriculum quality is high and subscriber attrition is low. But when fires start, you have little choice but to drop everything and put them out. 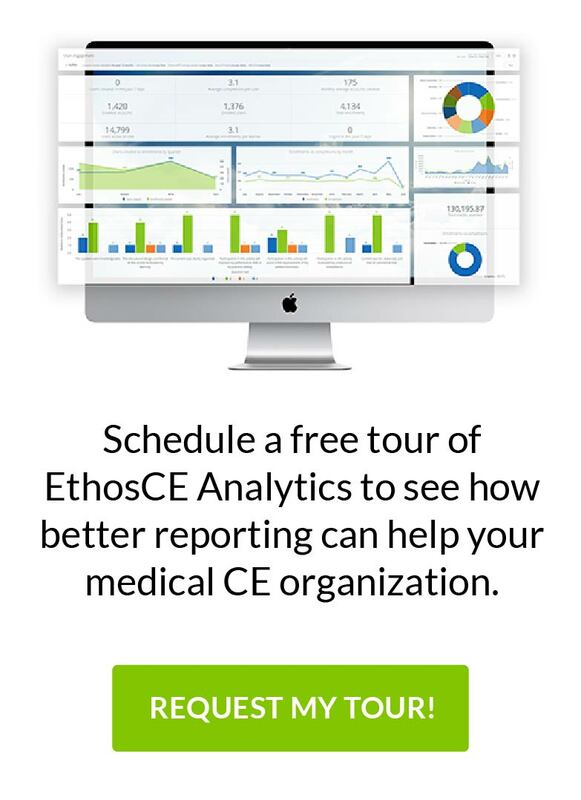 A feature-rich CME management platform allows you to focus on your primary goal, rather than on time-consuming administrative tasks that can hinder your productivity (and cause huge problems if completed incorrectly). How does this relate to increasing activity completion rates? Getting course administration and management tasks out of the way means that your team can devote resources to stoking learner engagement and making it easier for students to complete courses on time. If you choose to use a CME management platform it should include an LMS which allows you to rapidly implement content changes when activity completion rates fall. That flexibility is an important asset in your efforts to grow your CME program. A lag between the time when user experience issues are identified and a redesign of the LMS to remedy them represents a costly expenditure of resources— resources which could be better spent on curriculum development. For more than 16 years, EthosCE has supported successful CME programs as they worked towards and achieved their CME benchmarks. In addition to our CME management platform, we also create custom e-learning modules designed to enhance learner engagement and provide a superior user experience for your members. If you are ready to boost course completion rates and revitalize your CME programming, take a look at our platform’s features and schedule a 1-on-1 with us here. Want to Know Which Learners Provide the Most Value? Here’s How. HealthCamp Philadelphia Announced!